Prince - The General Screw Steam Shipping Co. Ltd.
Machinery: 9 knots. 815 ihp. Made by Maudsley, Sons & Field. Registered: No.394 on 8th July 1854 in London. Other info: Certificate granted 27th April 1854. Built for the Australian trade but not so employed. Designed by Mr. T. Waterman, jun. Became a transport for the Government on completion. Purchased for £105,000. History: 7th July 1854. Commander Steane took up his commission as Admiralty agent. 3rd July 1854. The Government has chartered the ship, now fitting up at Blackwall, for the conveyance of troops. 10th July 1854. Due to sail from Southampton for Port Phillip and Sydney, but still at Deptford and being hired by the Government for the conveyance of French troops and horses to the Baltic. 17th July 1854. Lieutenant Robertson left Woolwich evening for Greenhithe to inspect the ship. 18th July 1854. Sailed in the morning for Calais Roads to embark French troops for the Baltic. 18th August 1854. The General Screw Steam Shipping Company sold the ship to the Government with a net profit to the company of £15,000, transferred by bill of sale 64/64 shares to the Lord Commissioners of the Admiralty, Produced and recorded 21st August 1854. 27th August 1854. An A.B. was killed while ashore kicking a live shell at Bomarsund. 19th September 1854. Arrived at the Royal Arsenal, Woolwich, and appeared to have a number of troops on board. 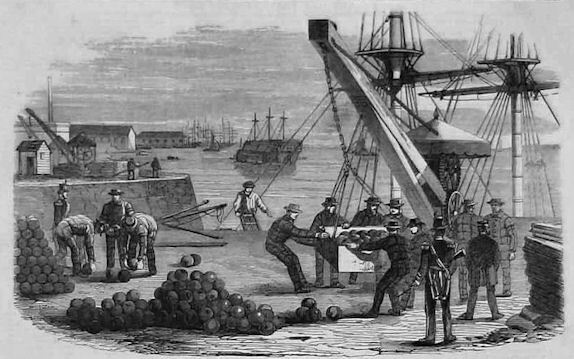 She discharged about 250 tons of shot and shell brought home from the Baltic. 12th October 1854. Had her compasses adjusted and waiting to have the repair to her capstan which has been sent to Woolwich. She has £200,000 in specie on board, for the payment of the troops. 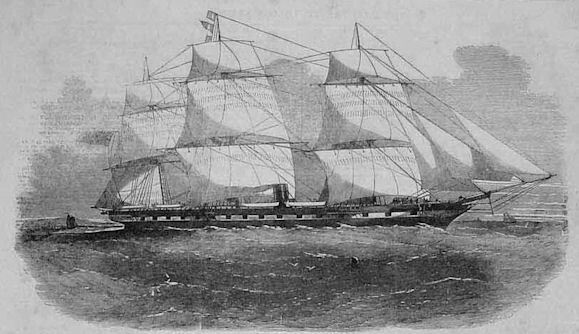 In the afternoon, a sergeant with three privates of the Royal Sappers and Miners embarked on board and have with them four complete sets of diving apparatus and a voltaic battery, to be employed in the blowing up of the vessels sunk by the Russians at the entrance of the harbour of Sebastopol. 16th October 1854. Sailed from the Drowns for the Crimea. 8th November 1854. Arrived at Balaklava with 1,500 troops, after the heavy loss of Sunday last, this will be a most welcome reinforcement. 14th November 1854. Foundered in the Black Sea. 18th December 1854. A return, issued from the Store Account Office, show that the items of warm clothing, lately lost on board the ‘Prince’ were as follows – 35,700 woollen socks, 58,000 woollen frocks, 17,000 flannel drawers, 2,560 watch-capes, 16,160 blankets, and 3,700 rugs. 8th January 1855. The P & O steamer ‘Himalaya’ arrived at Southampton with Mr. Cotgrove, midshipman and six men all saved from the ill-fated vessel. 18th March 2010. 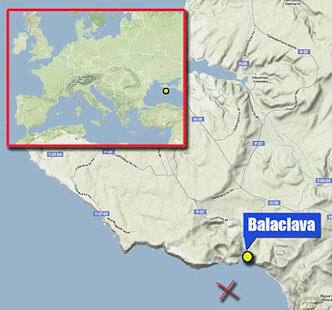 Archaeologists say they have discovered the wreck near the port of Balaclava. Divers had discovered a plate fragment from the captain’s mess.